(Continued from page 18) h a rd s c a p e s Top, Left The 350' long structural retaining wall uses Pavestone Anchor Diamond Pro Stone Cut series in a sandstone color. Three sizes of blocks were used: 8"x7", 8"x11", and 8"x18". Daisies, pampas grass, roses and more add a splash of color to the space. 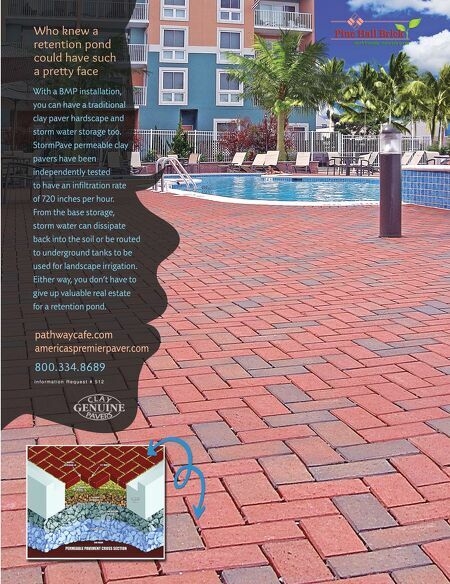 Top, Right Mocha blend pavers in a random pattern complement the sandstone retaining wall. A Japanese maple tree and elephant ears give the space a relaxed feel. Bottom The curved retaining wall uses trapezoid shaped caps along the curve to reduce the number of cuts required in the field. Rosemary, butterfly bushes, roses and more are planted above and around the retaining wall. Heritage buff colored Holland pavers are arranged around the in-ground firepit in a herringbone pattern. 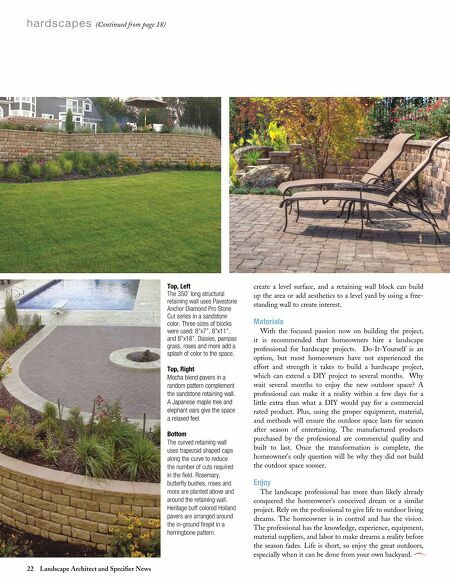 22 Landscape Architect and Specifier News create a level surface, and a retaining wall block can build up the area or add aesthetics to a level yard by using a free- standing wall to create interest. Materials With the focused passion now on building the project, it is recommended that homeowners hire a landscape professional for hardscape projects. Do-It-Yourself is an option, but most homeowners have not experienced the effort and strength it takes to build a hardscape project, which can extend a DIY project to several months. Why wait several months to enjoy the new outdoor space? A professional can make it a reality within a few days for a little extra than what a DIY would pay for a commercial rated product. Plus, using the proper equipment, material, and methods will ensure the outdoor space lasts for season after season of entertaining. The manufactured products purchased by the professional are commercial quality and built to last. Once the transformation is complete, the homeowner's only question will be why they did not build the outdoor space sooner. Enjoy The landscape professional has more than likely already conquered the homeowner's conceived dream or a similar project. Rely on the professional to give life to outdoor living dreams. The homeowner is in control and has the vision. The professional has the knowledge, experience, equipment, material suppliers, and labor to make dreams a reality before the season fades. Life is short, so enjoy the great outdoors, especially when it can be done from your own backyard.